It’s been a light couple of months, but there are always hidden gems to be found if you look hard enough. Wannabe treasure hunters can venture into a tower from which no adventurer has ever returned, or scour the deserted castle ruins of a Scottish loch island. Amateur detectives might prefer to investigate a disappearance of a friend in a mysteriously deserted film studio. You could also brave the horrors of war for a pair of Russian soldiers in WWII, or the ghosts awaiting you in the darkness of a locked school. 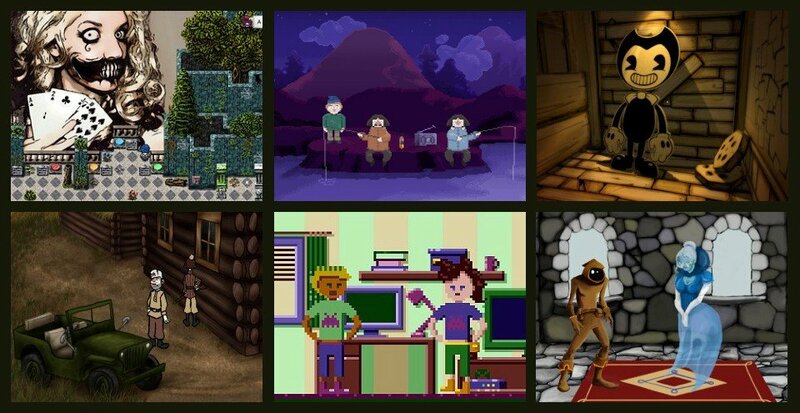 All these choices await in this month’s round-up of releases from the freeware scene. And if you think the smaller selection is cause for concern, it’s probably because so many developers were gearing up for Adventure Jam 2017, which we’ll be covering extensively next time! Jheed, a novice adventurer who wants to be in the Rogue Guild, is sent to the Tower of the Weeping Queen to show that he is worthy of membership. The tower is rumored to contain a great treasure but no adventurer has ever returned from it! In order to get the loot, Jheed must lift the curse that holds the ghost of the Weeping Queen prisoner in the tower. For that, he has to pick a lock, find some Swiss cheese, make a battering ram and pry a secret from a gnome. The second installment of Rogue Quest by Expera Game Studio is staged quite a lot like its predecessor. It starts at the entrance of an ancient building, in which all rooms are the same size and have old doors on the left and right sides of the screen. But in Episode 2, the quality of the graphics and sound is a lot better. Gone is the pixel art of the series debut in favor of smooth, hand-painted backgrounds. Jheed walks around in a high-resolution environment with many bright colors, accompanied by clear, cheerful music. Unfortunately there is still no voice acting. All spoken text is shown in a neat font appearing near the speaker's head. The few sound effects, mostly the crashing of things falling apart or being blown up, are not very accurate but they do the job. Only the left mouse button is needed to control the game. The inventory can be brought up by clicking the satchel in the upper left corner of the screen. You’ll also find an icon depicting a telescope there; clicking this reveals all hotspots in the scene, which comes in handy during one part of the game. On the upper right are buttons for getting a hint if you need one, and for the game's menu. The story and gameplay are a bit more substantial this time as well: Jheed now has a little ally who helps him during the quest by answering questions, and some of the puzzles are complicated. There is one nasty challenge involving the untangling of four wicks that seems to have a bug: if you make a mistake the remarks Jheed makes after that don't fit your actions anymore. I needed the hint system and a bit of luck to solve that one. But apart from that, Rogue Quest: Episode 2 is a really nice game that shows a lot of improvement visually over Expera's earlier games. Rogue Quest: Episode 2 can be played online at Kongregate. 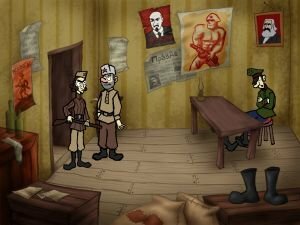 Sniper and Spotter Serving the Motherland is Blondbraid's third game about the Great Patriotic War in Russia in the 1940s, and the second game about Sniper and Spotter in particular. The two soldiers Olga and Ivan, who debuted in Sniper and Spotter Being Patriotic, now find themselves in a small village that their captain wants destroyed because their battalion is losing the battle and the Germans will soon take over the town. To prevent anything from the village being useful to the Nazis, Olga and Ivan have been sent from the front and now have to poison the food and well, and burn the houses. They also have to destroy the bridge over the river. Whilst doing so, they meet the young German who also featured in Fallen Soldier. The game is shown in third-person view in beautifully detailed images. All characters are hand-drawn with thick black outlines and have distinct characteristics: Ivan is a good man who slouches a bit, always looks upwards, and moves his arms continuously, while Olga is a severe and prim-looking woman who would love nothing better than to kill all the German 'fascist animals' personally, forgetting that most of them are lads like Ivan who would rather be somewhere else than fighting this horrible war. Luckily, Ivan has some control over her or she would be a fanatical murderer. The game world features an office, a small food storage building, the village’s lone street, a field and a bridge, and in each the colors reflect the wartime subject matter, consisting mostly of muted hues of brown, yellow and green. The gameplay is accompanied by fitting dark music, consisting of seven different tunes. Which you hear depends on the current location and how far you are in the game. There is no voice acting; all spoken text is shown on screen in a rather small font which is sometimes a bit difficult to read, with a different color for each speaker. Sound effects (mostly explosions and gunfire) are very good. At the start of the game you will find a button that unlocks a neat explanation of how the controls work, though they're nothing extraordinary: left-clicking makes Ivan (the sole playable protagonist here) interact with things, right-clicking causes him to give a description of them, and the inventory appears when the cursor is at the top of the screen. There is a special way to use the single save slot, which you will encounter while playing. The puzzles are not hard but solving them is quite entertaining. Most of the obstacles are inventory-based but there is one dialogue puzzle in which Ivan has to convince Olga to do something. The interaction between Olga and Ivan is fun to experience, and there are lots of funny details in the environment too, such as the paper on the wall of the commissar's office. Despite the amount of humor to be found, however, given the circumstances most of the comedy is quite dark and conveys the ridiculousness of war and the decisions people make rather well. Sniper and Spotter Serving the Motherland can be downloaded from the AGS website. Loch Inch features an island in its middle, and according to legend, upon it a secret treasure is buried amongst the ruins of a medieval castle. Now a nameless gnome-like adventurer has arrived to find the treasure, armed only with his professor's notes, which contain lots of information about the Scottish lake and its surroundings. But he must first find a way to get to the island, a task that involves finding fuel for a jet ski and helping a couple fishermen. Simon Reid's The Treasure of Loch Inch comprises the fictional loch and a bit of the lands and hills around it, conveying a nicely rustic atmosphere. 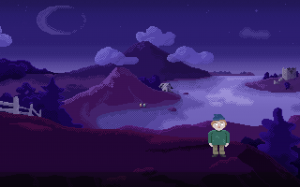 Shown in low resolution pixel art, the graphics nevertheless contain a surprising amount of detail: small objects are recognizable and even if the protagonist is far away in the background we can see his eyes blink. The game is set late in the evening and therefore the color palette is reduced mainly to hues of purplish-blue and brown. The only music you hear is a nice tune at crucial moments, and over the radio that one of the fishermen has with him. The few sound effects like emptying out a bottle are very simple. There is no voice acting; all dialogue is shown on screen in a different color for each speaker. Left-clicking on something makes the protagonist go there or interact with a hotspot, and right-clicking has him give a description of the object. 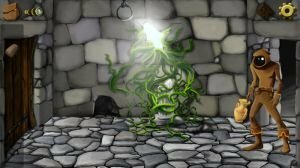 The puzzles are all inventory-based and easy to solve, although their solutions require some quite outside-the-box thinking. Once on the island, finding the treasure is no problem at all, which is a bit disappointing but understandable given the short time in which the game was developed. Although it wasn’t one of the finalists in this year’s Adventure Jam (which will be detailed here next month), The Treasure of Loch Inch was made in just two weeks for entry into the competition, and I found it a cozy little game and a nice way of whiling away 20 minutes or so. The Treasure of Loch Inch can be downloaded from the AGS website.